Explore easy solutions for LG OPTIMUS L9 P769 / P768 / P765 / P760 problems. When the time smartphone start to have bigger screen, the LG OPTIMUS L9 P768 / P765 use 4.7 inches (the P769 use 4.5 inches) LCD screen with IPS bright color. We can have better experience see the images or photo taken from 5 megapixel camera at this smartphone. LG OPTIMUS L9 have good battery capacity at 2150mAh, then the user will get more longer battery life for daily activity at this smartphone. How to Fix and Problem Solving for Recovery LG OPTIMUS L9 P769 / P768 / P765 / P760 hang or not responding or malfunctions or stuck or freezing or bricked ? Using LG OPTIMUS L9 P768 / P765 can be more fun because it have 1GB RAM size. The main functions of RAM at this smartphone are use to keep and save the running applications into memory, the applications could be the use or stay at background screen, so the applications does not need to be close and restart from beginning when we need to use it again. Having said about the big 1GB RAM, we can install many applications from Google Play Store. However, we should know that not all applications can run or compatible with LG OPTIMUS L9 P768 / P765. Some applications could make this phone have problem like hang or stuck or bricks or broken or frozen or LCD touch screen not responding. In some other situations, the phone might hang and stuck in the logo screen. If this problem happen, we should try to force soft reset or force reboot or restart LG OPTIMUS L9 P768 / P765 to delete any temporary files or caches. If the problem still happen, then we should do hard reset or master format. How to Force Soft Reset or Force Reboot or Restart LG OPTIMUS L9 P769 / P768 / P765 / P760 ? When we have problem with LG OPTIMUS L9 P768 / P765 like hang in the middle of running applications which make the touch screen become not responsive, then we should force soft reset or reboot or restart by open the back case and remove the battery. This step is easy to do for anyone. Once the phone force off because does not have power battery, wait about 5 seconds, after that put again the battery in the right positions. Continue press the Power button until the phone turn on again. When we still can access the menu or touch screen still responsive with our finger touch, we can soft reset this phone by press the Power button for several seconds, we will see the pop-up menu to restart or turn off. Choose restart/reboot than tphone will reboot, wait until the booting process finish. This process will not remove or delete any important data, so we can do soft reset or reboot anytime we need it. The LG OPTIMUS L9 P768 / P765 will do the master reset process. The LG OPTIMUS L9 P768 / P765 will continue master reset, wait for several minutes until the the phone start like new again. How to Restore and Reinstall Clean Android Operating system / firmware at LG OPTIMUS L9 P769 / P768 / P765 / P760 ? After we install many applications and do many thinks at LG OPTIMUS L9 P768 / P765, sometime we get problem with the operating system or firmware. The phone act not normal and always reboot by itself. The other user also report different situations that make us need to do reinstall or restore the clean and factory default setting Android operating system or firmware at LG OPTIMUS L9 P768 / P765. For install the operating system of course we need the file source of operating system or firmware, and this files already save safely inside LG OPTIMUS L9 P768 / P765 ROM, so we do not need to connect other device when we need to reinstall or restore the OS. Just follow the hard reset step above, then the clean factory default setting Android operating system or firmware will be reinstall automatically. Please remember, doing hard reset or reinstall or reformat will make all important data and installed applications remove or wipe from this phone, so battery we do backup before perform it. How to Unlock or Fix or Bypass or Solutions for LG OPTIMUS L9 P769 / P768 / P765 / P760 forgot password code or security lock screen pattern or pin (lost password)? We can give more protections at LG OPTIMUS L9 P768 / P765 by using screen lock pattern or password pin protections. There are also any other way, but some user have problem with the answer of security protections. If we are forgot the answer then we need to bypass or unlock LG OPTIMUS L9 P768 / P765 with Google account or Gmail account. How to do that? Try to do several time wrong answer for that security protections until the phone locked or freeze for several seconds. In this moment we will see the Forget Password / Pattern button, press this button to bypass forgotten security screen lock pattern or password protections user Google account that we already saved before. If we can not access Google account, then we should do hard reset or master format. How to Improve Performance LG OPTIMUS L9 P769 / P768 / P765 / P760 to make run more faster? After use LG OPTIMUS L9 P768 / P765 for several months, some user report the phone become slowly to load or access some applications. Usually this problem happen because there are too many applications run in the background. As we know this LG OPTIMUS L9 P768 / P765 have 1GB RAM, this is big, but still have limitation if we install too many applications. Therefor we should try to remove or uninstall several not use applications. If we want the performance of LG OPTIMUS L9 P768 / P765 back faster again like new, then we have to do hard reset or master format steps above. Is that any other secret code of hard reset LG OPTIMUS L9 P769 / P768 / P765 / P760? At this moment, there is no other secret code or secret key to do the factory reset of LG OPTIMUS L9 P768 / P765. Just try to do the hard reset above. Can I upgrade LG OPTIMUS L9 P769 / P768 / P765 / P760 to Android Jelly Bean or Android Kitkat ? At the first time produce from factory, the LG OPTIMUS L9 P768 / P765 have Android Ice Cream Sandwich operating system. But thank you for LG development team that already release the update OS to upgrade LG OPTIMUS L9 P768 / P765 Android Jelly Bean firmware. How to update process for LG OPTIMUS L9 P768 / P765 Android Jelly Bean or Kitkat? Please note, the upgrade officially from LG only until Jelly Bean. The upgrade can be done with Over The Air update, of course we need Internet data connection and we should use Unlimited Wifi connections to safe our GSM operator credits. Make sure the we do this step with power source adapter connected, because we need more time to download the new file source from LG server, the time depend on our Internet data connections. Follow the step to update and wait until the process finish. Why I can not start or activate or use my Wifi or Bluetooth connection at LG OPTIMUS L9 P769 / P768 / P765 / P760 ? Some problem usually happen because we have an applications that can block the Wifi or Bluetooth data network. We should try to find that applications, if we can not find it, better we try to do hard reset or master format. Some user of LG OPTIMUS L9 P768 / P765 also reported the Wifi have trouble because the firmware problem, so we need to update with the latest version to fix this problem. How to make Longer Life for LG OPTIMUS L9 P769 / P768 / P765 / P760 Battery ? The battery of LG OPTIMUS L9 P768 / P765 already big enough for daily acitivity, because this phone use 2150 mAh battery capacity. However, the strong life of battery very depend on our usage. More active we use the LCD screen or Internet data connection, more power that this phone will consume. Please try to reduce the blank spot of GSM network, because the phone will use more power to catch the good network. We also strongly advice LG OPTIMUS L9 P768 / P765 user to safe the battery more longer by disable the Wifi or bluetooth when we not use that anytime. Using 2G also can safe the battery but of course 3G is better to get faster Internet data connection, so choose as what you need. [A] Hi, if you forgot security protections answer, then you can try to restore using Google account. Please give several time wrong answer continuously until your phone frozen for several second, at this time you can try to give Gmail username and password that you have been signed-in before. If still can not work, then you have to do hard reset using hardware button combination key to reformat your LG Optimus L9 operating system to factory default. [A] Hi, usually the factory apps will downloaded and installed automatically once we agree to upgrade from notification bar. However, it still can not upgrade, then better you let it work as that, unless you want to try performing hard reset, but need to backup all important data before doing hard reset. The information from this page describe about lg p768 hard reset,hard reset lg p768,lg p765 hard reset,how to hard reset lg p768,lg p760 security error fix,how to do hard reset for lg p769,lg p769 security error,LG- P769 reload,wifi problems for lg p768,วิธีhard reset lg p768. If you need another resource for hard reset, use search function at this homepage or find from our related posts. 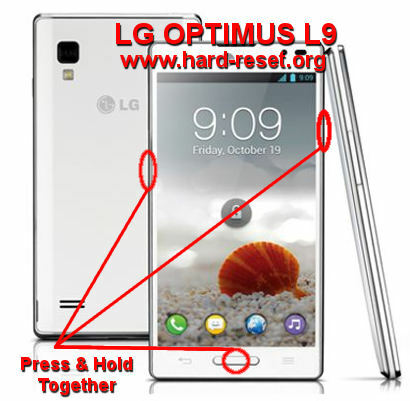 Hi, the default way to do hard reset at LG Optimus L9 are using Power button + Volume Down button + Home Button key. All 3 keys should press and hold together about 10 seconds, then you will see the hard reset menu to follow. If you still can not access this menu, the please try again carefully. This steps available for standard LG Optimus L9, but maybe can not work for some root or custom ROM smartphone. Hi, if your phone get hard bricks or hardware problems, then the hard reset using hardware key combinations can not work as well. Please consult with LG authorize service center for further check. Hi, i m unable to connect wifi in my LG P769 however I can use the wifi in my HTC. I’ve done twice factory reset but no luck. Switch off and on the modem. I can see some names in my phone but i can’t see the name of my wifi. If i insert manualy the name of the wifi it says “not in range”. Hi, in some case this problems happen because the wifi access point or router use specific security, please change the security access of your access point maybe to WEP to test weather it can work or not, but of course this will make your Wifi access point become more vulnerable. However, you can also test using different Wifi access point, maybe at different location just to make sure your LG Optimus L9 wifi still can work normally, not get hardware trouble. and i was told that the mainboard is broken and need to change ?!?!?!?!?! Hi, unfortunately we can not give good answer for Rooted LG Optimus L9 because there are several non standard possibilities that make your trouble happen. Because you have already consult with LG authorize service center, but you not get the answer, then maybe you can try to discuss at XDA Developers community, perhaps they can help your trouble. Hi, when your LG Optimus L9 LCD screen show LG Logo then continue releas all button to see the menu. Please do steps at #option 2 above carefully. Hi, you have do to hard reset. If your LG Optimus L9 can not boot properly, then please follow steps at #option 2 above to hard reset using hardware button combination key. It will reformat clean factory default Android operating system operating system at your LG Optimus L9. In mobile when I am switch on. It LG logo is came after long time. In a display is showing as ENCRYPTING. Reset phone. But we press the button no response…. Pls give me a proper solutions. Hi, usually when your LG Optimus L9 get encryption problems, then the only solution that we can do is doing hard reset using hardware button. Please follow steps to hard reset your LG Optimus L9 using hardware button combination key like steps at #option 2 above, then your phone will reformat operating system to factory default and will format your internal memory data as well. Hi, usually the factory apps will downloaded and installed automatically once we agree to upgrade from notification bar. However, it still can not upgrade, then better you let it work as that, unless you want to try performing hard reset, but need to backup all important data before doing hard reset. Hi, if you forgot security protections answer, then you can try to restore using Google account. Please give several time wrong answer continuously until your phone frozen for several second, at this time you can try to give Gmail username and password that you have been signed-in before. If still can not work, then you have to do hard reset using hardware button combination key to reformat your LG Optimus L9 operating system to factory default.